Beautiful in its simplicity, our Valencia waterfall faucet is the best choice for decorating your bathroom wall and filling up your bathtub in style. It comes with hot and cold water mixer for your convenience. It is wall mounted three holes and two handles, with brushed nickel finish. The body, spout and handles are made of brass, while the valve core material is ceramic for best performance and long lasting life time. It comes complete with accessories and installation instructions. I've been looking for something like this for quite a while now, and though I wasn't very successful at first, I finally found it here. 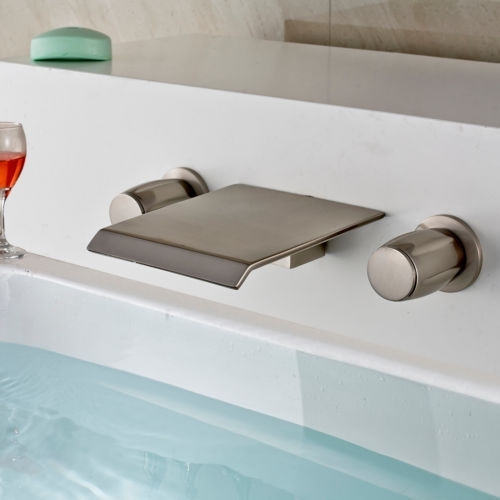 I wanted a wall mount bathtub faucet simply because our old faucets were just like that, and I didn't want to have to drill holes in the tub just to make way for a deck mounted one. This product actually looks great and works great, and I highly recommend it. After seeing all the other bathtub faucets in this site, I knew that this would be the better choice - considering my preferences at least. This actually looks good in real life, has a nice design and finish and looks to be of solid build, too. I actually love this thing, and feel that this is one of the best purchases I've made so far. I'm just worried about hitting myself against the spout at first, but then that never happened.